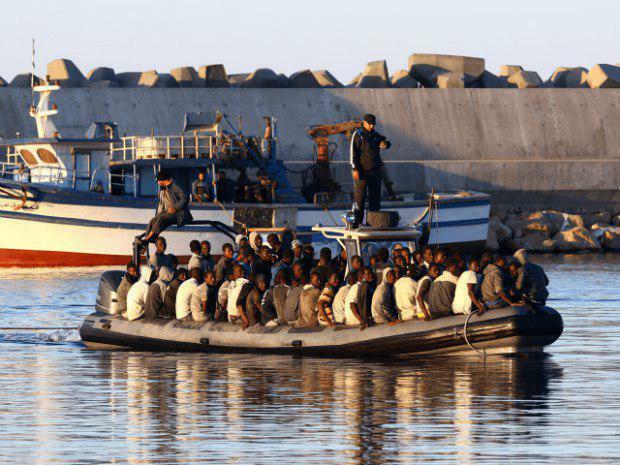 TRIPOLI, March 30 (Xinhua) -- Libyan authorities on Friday said they rescued 117 illegal immigrants off the coast of the western city of Al-Khoms, some 120 km east of the capital Tripoli. "Coast guards patrol rescued 117 immigrants of different African nationalities on a rubber boat," the Libyan coast and seaport security said in a statement. The rescued immigrants include 84 men, 15 women and 18 children, the statement said. The migrants have been provided with humanitarian and medical assistance and taken to a reception center in Tripoli, the statement added. Following the 2011 uprising that toppled former leader Muammar Gaddafi, Libya has been plagued by insecurity and chaos, and has become a preferred point of departure for illegal immigrants hoping to cross the Mediterranean Sea into Europe.